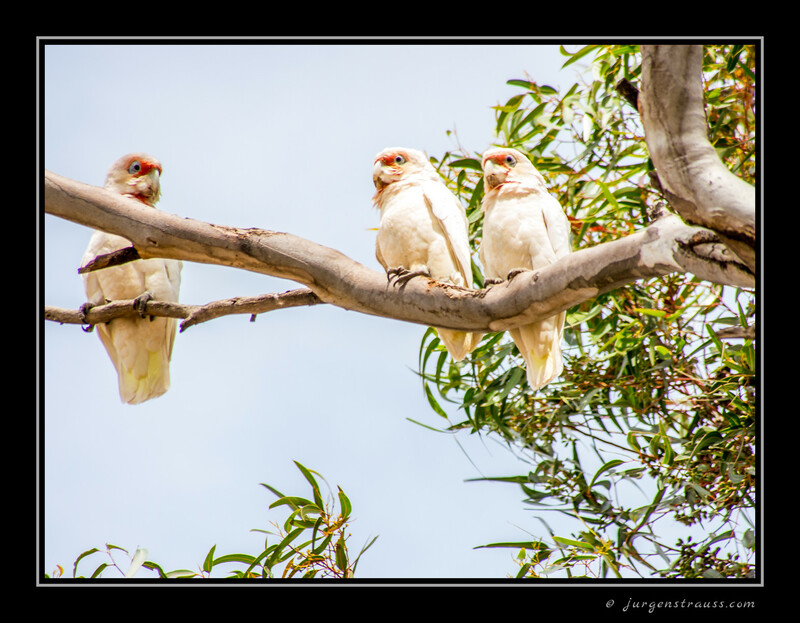 Every year in early December, a flock of hundreds of Long-billed Corellas migrates to Little River and calls that township home until the colder months, when presumably they migrate to the north, to return again the following summer. 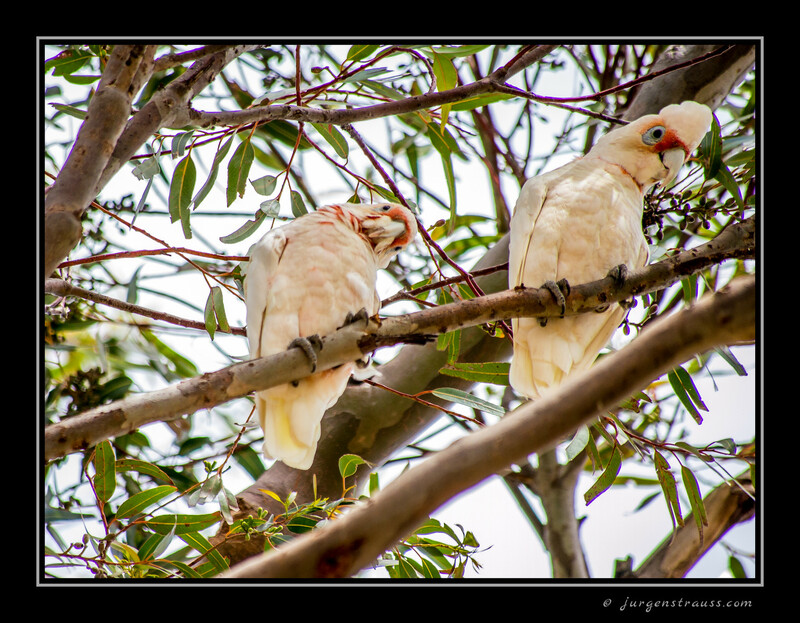 These guys love the big gum trees around Little River, where they frolic and feed and conduct quite a bit of serious pruning as well. Today, they were willing subjects for me to try out my 600 mm telephoto lens. 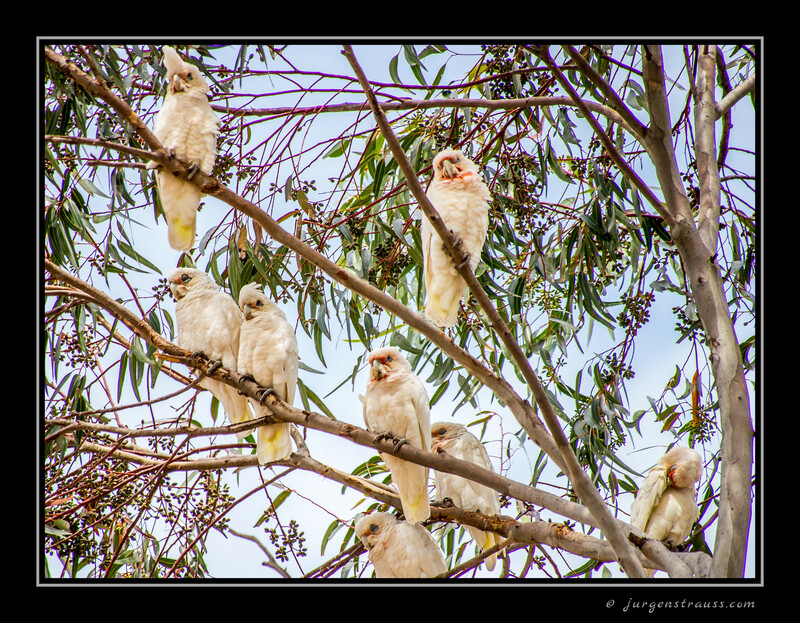 ​The Long-billed Corella is a medium-sized white cockatoo with a short crest (not always visible) and short tail, stocky body and a distinctive long upper mandible to its bill. There is a faint yellowish wash on the undersides of its wings and tail, and orange-red splashes on its forehead, throat and an orange-red crescent across its upper breast. The eye ring is pale grey-blue. It is a conspicuous and gregarious species, often seen foraging in large flocks on the ground. Photographed with: Olympus Pen EP-3, with Panasonic Lumix G Vario 1:4.0-5.6/100-300 mm lens set at 300mm (600 mm equivalent in 35mm language), f5.6, 1/250 exposure ISO 200 - plus 2 stops to account for the highlighted sky background.